Looking for the best flea sprays in 2019? How do flea sprays work? How to choose The Best flea spray? How to use a flea spray? Best way to make your own flea spray? Short on time? Check out our top picks for flea sprays. Continue reading if you want to learn more! Do you want to learn how to stop your house and pets from being infested with fleas? If the answer’s yes, you’re in the right place. But before we start, I have some bad news. The number of fleas in the United States is increasing. This means it’s very likely that you or someone that you know is going to have to deal with these frustrating pests at some point in life. But wait... here's more bad news. Getting rid of them isn’t easy. It takes time, patience, and it can be expensive. Not only that, a flea can cause an allergic reaction for both you and your pets. But, it’s not all doom and gloom. You have several ways to control fleas depending on where they are and how many you have. This article looks at some of the best flea sprays on the market to help you get rid of these pests before they take over your life. Similar to other pest control sprays, flea sprays act as direct contact killers. Most do not leave residual chemicals, and they tend to come in either aerosol cans or spray bottles (think windex style). Most sprays use a form of pyrethroids, which are natural insecticides extracts from the chrysanthemum flowers. The more effective sprays also contain an insect growth regulator (IGR) aspect that halts the rate of reproduction. Before you can choose the best flea spray to suit your situation, you first need to consider what you want to use it for. Some sprays are 100% safe to use in your home and on the skin of your pets, but others have a more potent chemical base designed to treat larger infestations. For example, Pyrethroids are relatively safe to use on dogs, but can be toxic to cats if they include a residual effect. Cats are also more susceptible to toxicity with permethrins and natural oils. Always read the label of your product carefully to check how to apply the product in safest manner possible. Read Also; What're the best flea collars for cats? It's important to understand that not all flea sprays can be applied to your pet's bedding and not all flea sprays can be applied directly on your pet. Flea sprays vary and are labeled for different uses. Please read the label of your spray before application. If you're going to apply a flea spray directly, first bathe your pet to get as many fleas off before application. Next, lightly spritz your pet starting from the head to the tail applying an even coat. Consider also ruffling their fur as your continue lightly spritzing up and down their bodies (again head to tail). Avoid spraying directly into your pet's face. Instead, spray a cloth and lightly rub their face avoiding their eyes, mouth, and nose. If you're going to apply flea spray on your pet's bedding area make sure to clean up the area as much as possible. Consider throwing out old bedding (infested or not) for best results before applying your flea spray. When the area is cleaned, apply the spray until the area is visibly wet from the spray. Make sure to check the label of your product to make sure that any chemicals included in the product will not tarnish the surface you're applying it on. I would hate if you applied spray to a sensitive surface and for it to get ruined! Wait until the treated area is dry before letting anyone else come back into the space. Read Also: Top ways to prevent fleas in the first place? As with everything, you also have the option of trying your luck with making something at home. The most popular flea treatment uses vinegar. How to make homemade vinegar spray? A very common homemade flea spray uses a solution of half water and half vinegar to spray onto your pets. Fleas hate vinegar and are less likely to jump onto a surface or host that’s covered with it. This means your pets will have fewer bites. Fill a small bottle half way up with vinegar and to the top with water. Shake and spray onto your pet. When it’s dry, spray again to build up a thicker film of vinegar on your pet’s fur. In my experience, this does work. I sprayed it onto my dog and he had fewer bites over the course of the week. As great as this "natural" solution sounds, it's not 100% effective. First, it probably won't actually kill your fleas. The vinegar deters the fleas from your pets. This means you’re going to have to keep reapplying the spray to your pets. Second, it might lead you into a false sense of security. You think the fleas are gone, but in reality, the infestation may be insidiously getting larger somewhere else in your home. There are other homemade sprays that you can try, but most concoctions aren’t as effective as vinegar. This video explains some of the other homemade flea treatments that you can try at home. How effective a flea spray is depends on the active ingredient, how well it targets adult and baby fleas, and the correct use from the person using the spray. When fleas are still developing at the pupae stage they tend to be bit harder to kill given their cacoon-like protection. Only 5% of fleas are adults, the other 95% are developing. So, you need to use something that can overcome these obstacles and kill fleas at all stages of their life cycle. Unfortunately, it’s not as simple as it sounds. You can’t cover your house and pets in harmful and hazardous chemicals, right? Just remember that sprays are only really useful when you combine them with other preventative measures (pet baths, insect growth regulator, etc). Now that we've covered some of the flea spray basics, let’s take a look at some of the best flea sprays on the market. Wondercide's claim to fame is that they are a safe, non-synthetic alternative to flea control for pet owners. They use natural ingredients (cedar oil, lemongrass oil, and rosemary oil) to kill and repel fleas. The Founder and CEO Stephanie Boone appeared on Shark﻿ Tank getting a $500,000 offer to expand their product line. The oil stops their heart and has a strong repellent action too. You can spray this onto your pet's fur and on your clothes. Wondercide uses a mixture of natural ingredients to repel fleas and also reduces the itching on your pet’s skin. There have been some complaints about the powerful odor from their Cedar line, but Lemongrass and Rosemary seem to be more tolerable. Also I found that they changed up their original formula and some customers have complained that it reduced effectiveness. It isn't waterproof. You need to reapply after your pet goes for a swim or takes a bath. As opposed to the Wondercide above, this product's main purpose is to spray the surrounding area where your pet lives. It is not something you would spray directly onto your pet. Permethrin, Pyriproxyfen, and Pyrethrums are the active ingredients of Virbac. This can kill adults and stop nymphs from developing, but it doesn’t impact the eggs (use a dedicated insect growth regulator for that). When you apply this product, it's best to leave the room until the spray dries up. This means you and your pets need to be out of the room for a while after you use Virbac. Similar to the Wondercide, Dr. Green Pet is a spray that uses essential oils (peppermint, clove, cinnamon, and cedar oils) to kill and repel fleas. You can spray this onto both cats and dogs and the scent of the spray deters the fleas. This is a good alternative to more powerful chemical products for when you take your dog out for a walk. The spray may seem like a good and natural product to use, but it's ability to actually kill fleas can be hit or miss. Make sure to shake before use for best results. Adams Plus combines an egg killer (etofenprox) with a powerful insect growth regulator (S-Methoprene). This product is labeled to be safe when applied to pets or area usage. This targets fleas at every stage of their life cycle with quick results. You can use it to kill the fleas or as a repellent depending on your need. 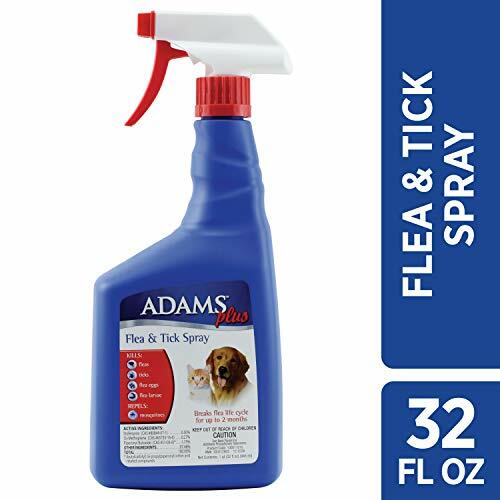 Adam’s is powerful and one of the best flea sprays out there that can kill at all stages of the life cycle. However, it may be too strong for some pets and most users complain of the pungent odor. 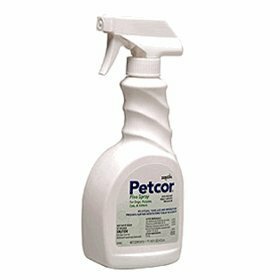 Petcor is another flea spray on our list meant to be applied directly to your cat or dog. Petcor uses natural pyrethins to kill fleas on contact and an insect growth regulator to help disrupt the reproductive cycle of your flea infestation. This is professional grade flea spray and should be treated as such for pet specific use only (not labeled for area use). Make sure to read the label carefully before use. If you're using this products for you cats, rather then spraying it directly on them, spray a bit on a cloth and apply gently. Adam’s is the best flea spray from this review. We also liked Petcor as well, but based on the multiple poor experiences with cat application I couldn't give it #1 honors. Adam's flea spray is meant to be directly applied to your pet, It kills fleas at any stage of their life cycle and disrupts reproduction. 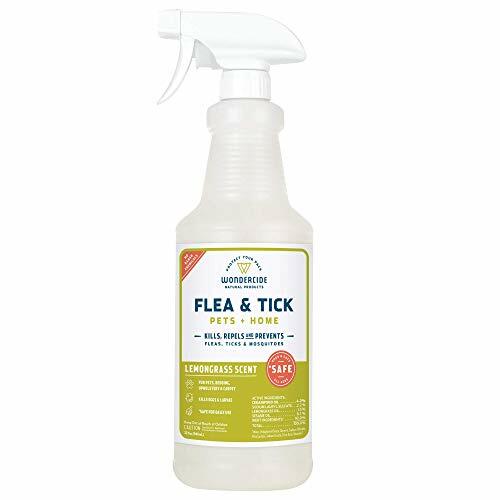 Compared to other products in this review, the spray is the most effective at killing fleas. Studies show that etofenprox works for up to three to four weeks to stop eggs hatching. And research into products that use Adam’s active ingredient, S-Methoprene, show it to kill the vast majority of fleas. Other products that use natural or essential oils can be hit or miss. As a final thought, remember, just because you've sprayed your pet doesn't mean your fleas problem is over. Wherever your dog or cat travels, you're likely to have flea eggs being dropped. In order to full eliminate the infestation, you'll need to deploy a more well rounded solution (pet baths, sprays, foggers, etc). Curious about other flea related products? Check out our other detailed guides to help you deal with your pest problems.